Some of the industry’s best new products have been recognised by the industry as part of this year’s QLD Mining Contractor Awards (QMCA). 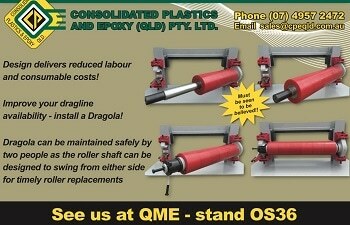 The finalists in the QME Best Product Launch 2016 category this year include Auxilium for its light tower refurbishment, Consolidated Plastics & Epoxy for its ‘Dragola’ Dragline Roller Assembly, Hella for the launch of ZeroGlare to improve operator safety and NSK Australia following the development of its sealed Spherical Roller Bearings. The awards organised by Bowen Basin Mining Club, are held in conjunction with Queensland Mining & Engineering (QME) Exhibition and seek to distinguish Queensland--‐based products that have made an impact on the industry in terms of innovation as well as other elements including how resourceful and applicable they are. In addition, the awards aim to showcase the strong industry credentials of Queensland’s many outstanding mining contractors and suppliers, particularly in light of the industry’s more competitive global landscape. Making a splash this year, according to judges, was Consolidated Plastics & Epoxy with its clever reinvention of an existing product into the Patented Dragline Roller, or ‘Dragola’. Daryl Oliver, Sales Manager at Consolidated Plastics & Epoxy (CPE), said the new product has been designed to further enhance the dragline capabilities of plastic conveyor guarding products. The beauty of this product for our clients is that it not only delivers considerable savings in labour and consumables, but it also improves dragline availability and can be safely maintained by two people. Launched earlier this year, Dragola is already garnering industry accolades, having recently been named as finalist in the “Out Of The Box” section of the Resource Industry Network’s 2016 Chairman’s Awards, as well as in the QME Best Product Launch category of the QLD Mining Contractor Awards 2016. Mr Oliver said the new product showcases the real benefits of plastic over steel, such as an improving the lifespan of equipment due to anti--‐corrosive properties. At the same time, co-finalist Auxilium’s light tower refurbishment project has also already received multiple gongs for innovation, including a recent international win at the Hochtief Energy Awards in Germany. The light tower project – submitted in conjunction with Auxilium’s client THEISS, outshone on the night to beat out 44 other international contenders. Managing Director of Auxilium Wayne Panther said the recognition that the project has received to date was extraordinary and proved that there is always room, even on a global stage, for Queensland-based innovators. As a company, we have always been driven by innovation as well as a need to continually push the boundaries, so to be recognised for this by the mining industry both here and overseas is very humbling,” Mr Panther said. When determining this year’s finalists, QMCA judge’s praised Auxilium’s light tower project for its clear scope and success criteria, adding that the tower refurbishment itself showed good innovation with industry--‐wide potential to simplify a common issue across many mine sites. The winner for QME Best Product Launch 2016 will be announced at an awards ceremony to be held on 27 July 2016. The awards night will also announce the winners of a number of other categories, with the full outline included below. Now in its 23rd year, the upcoming QME Exhibition will be attended by many of the industry’s leading brands and names when it launches in Mackay, 26th – 28th of July. Over 200 brands from all sectors ranging from conveyer--‐ belts to PPE will be showcasing their newest developments, many of which are interactively displayed this year, at exhibition stands throughout the showground. Exhibition Director of QME Robby Clark said the event will continue its tradition of focusing on business--‐to--business outcomes, while also offering plenty of opportunities for attendees to network and gain valuable industry insights. The QME exhibition is Queensland’s premier industry event to showcase new technologies and methods of production in mining, as well as participate in forum discussions on topics pertinent to the industry. The QLD Mining Contractor Awards is part of a week--‐long celebration of the mining industry in Mackay. QME 2016 offers an agenda that will present industry professionals with knowledge sharing and networking opportunities.